Smart Scent Vent Clips have a clear window so you can easily see when a replacement is due. 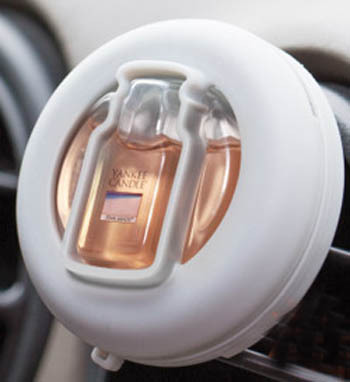 The odor neutralizing unit fastens securely to any vehicle's dash vents. Provides up to 60 days of continuous fragrance. Return To Our Yankee Home Fragrancing Page. Go To Our Yankee Candle Co. Home Page. Candle Graphics And Information Contained Throughout These Pages Courtesy Of Yankee Candle Co., South Deerfield, MA 01373-0110.